8+ players, 4-8+ female, 4-5+ Male. THE JESTER - a bumbling court jester, "the worst fool ever". KING HEIRONYMOUS - Stern and strict. THE QUEEN - his domineering wife. 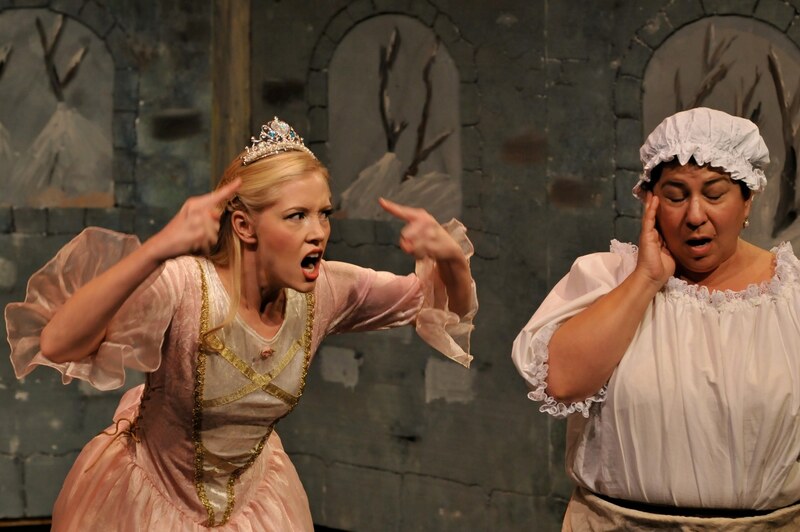 LUCY THE MAID - The Princess' maid-servant. PRINCE VALIANT - Handome, but as dumb as a bucket of rocks. ALLAN THE WOODCUTTER - A handsome young woodsman. WATT THE WITCH - Maybe a witch. Maybe a wise woman. CRESCENT MOON BEAR - A huge and scary bear. DRAGON - Even bigger and scarier. An oversize puppet. A royal palace, and a dark forest. A spoiled princess is tasked by a witch with giving to others if she wants to escape an arranged marriage to a stupid prince. A family fairy tale. 60-80 minutes (flexible). One can also add a size and gender flexible ensemble of dancers. Chrissy Anderson and Anoush Nevart in 2009 at the Promenade Playhouse, Los Angeles. Directed by Paul Messinger, produced by Tara Donovan for Cruthaigh Productions. 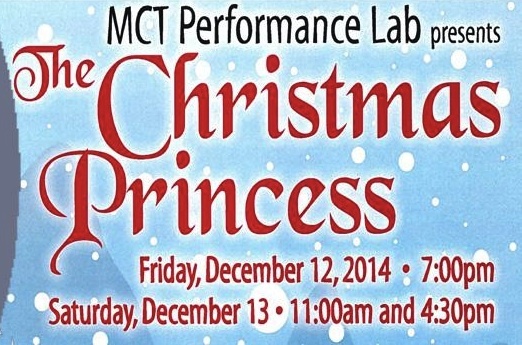 THE CHRISTMAS PRINCESS is an original fairytale, based on elements of Japanese folklore and western mythic archetypes. And it's silly. 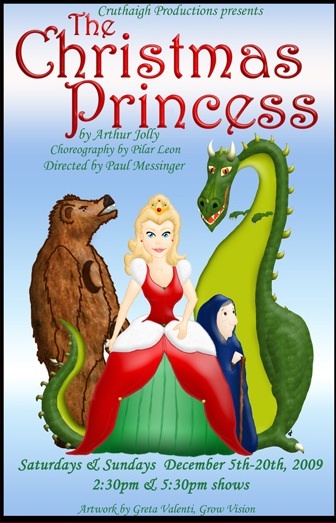 Lots of wonderful jokes, a big scary bear who roars - an even bigger scarier dragon who threatens to eat the princess. 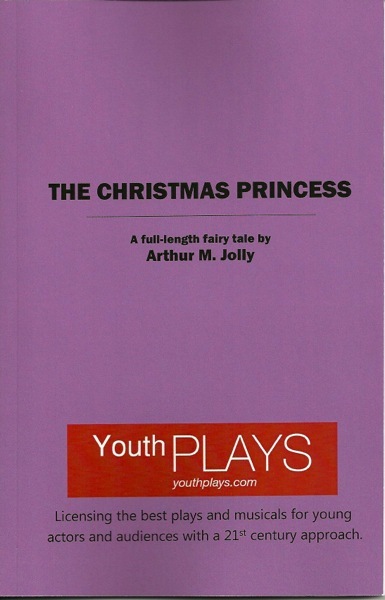 It is published by YouthPLAYS., and is suitable for all audiences. 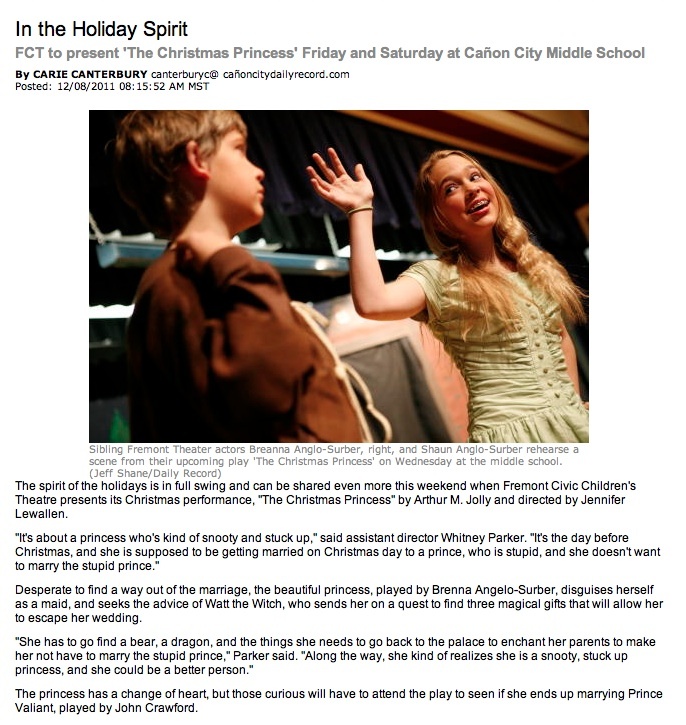 It premiered in 2005 at The Black Box Theatre in Santa Monica, and has been produced many times since, both in theatres with adult casts and with children. 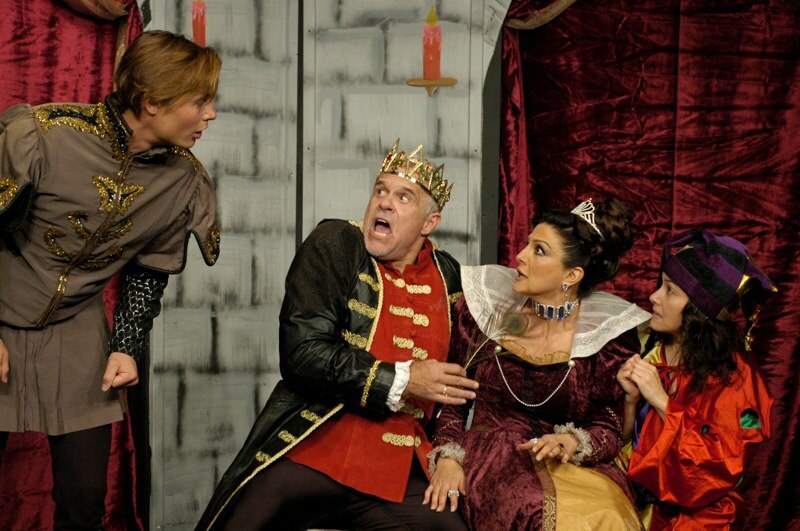 Erik von Detten, Bill Jones, Christine Kludjian and Dikla Marshall in the December 2007 production at the Black Box Theatre in Los Angeles. 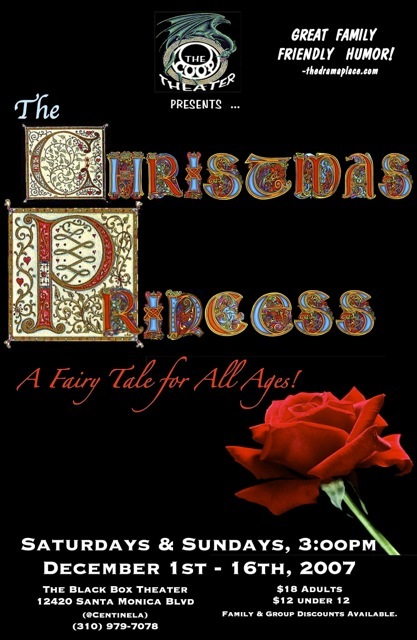 The play starts on Christmas Eve - and the palace is in turmoil. The next day is not only Christmas, it is the wedding day of the beautiful Princess and the handsome Prince Valiant. 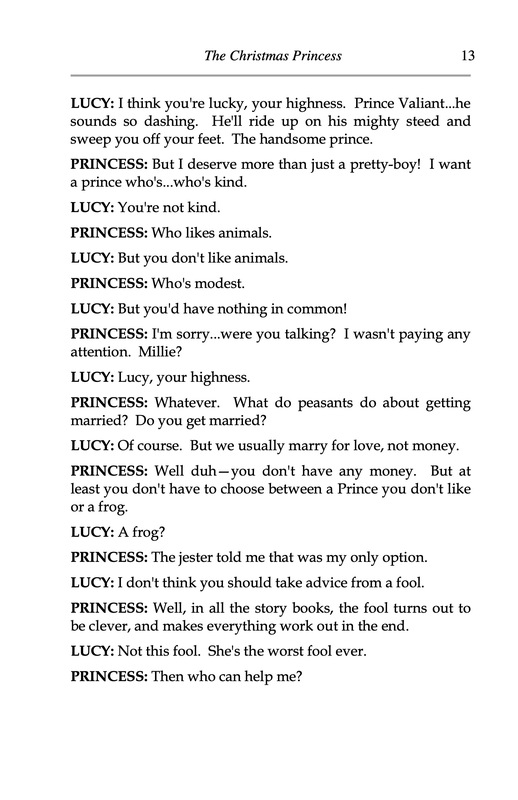 The problem is - the Princess doesn't want to marry a stupid Prince she's never met. Desperate to find a way out of the marriage, she disguises herself as a maid, and seeks the advice of Watt the Witch, who sends her on a quest to find three magical gifts that will allow her to escape her wedding - a hair from the chest of the Crescent Moon Bear, a tear from a Dragon, and a petal from a blood-rose. 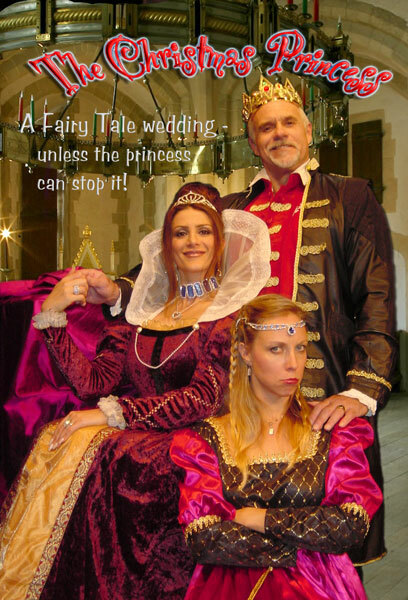 Meanwhile, the Prince falls for the maid, and the Jester - the worst fool ever - is given an ultimatum: to make the King laugh by the royal wedding the next day, or be thrown into a dungeon. 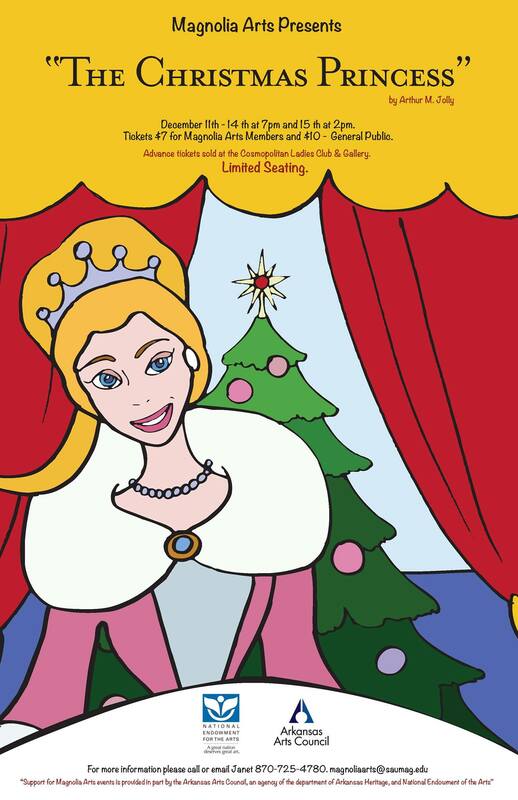 On her journey, the Princess learns to use her courage and her wit to find her true self - which turns out to be where the real magic lies; and manages to not only get out of marrying the Prince, she finds true love with a lowly woodsman, and everyone lives happily ever after. Two upcoming productions this season! 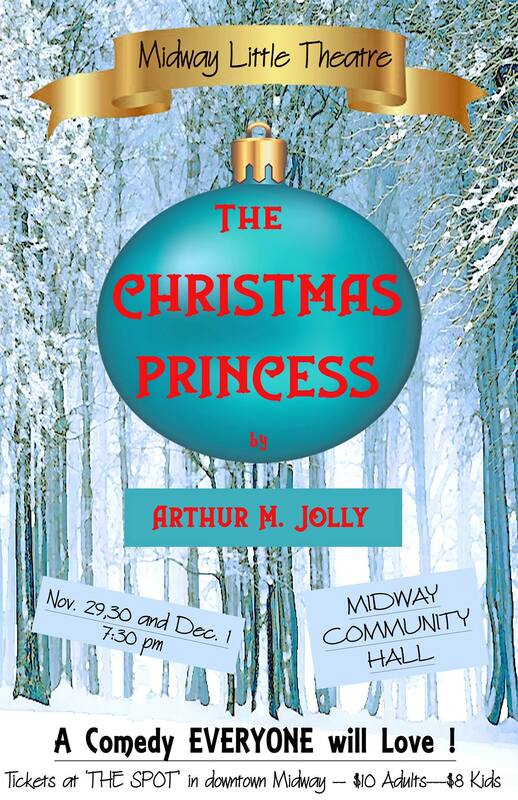 The Christmas Princess will be at the Midway... and Beyond Little Theatre November 29th - December 1st, 2018, at 692 7th Avenue, Midway, BC. 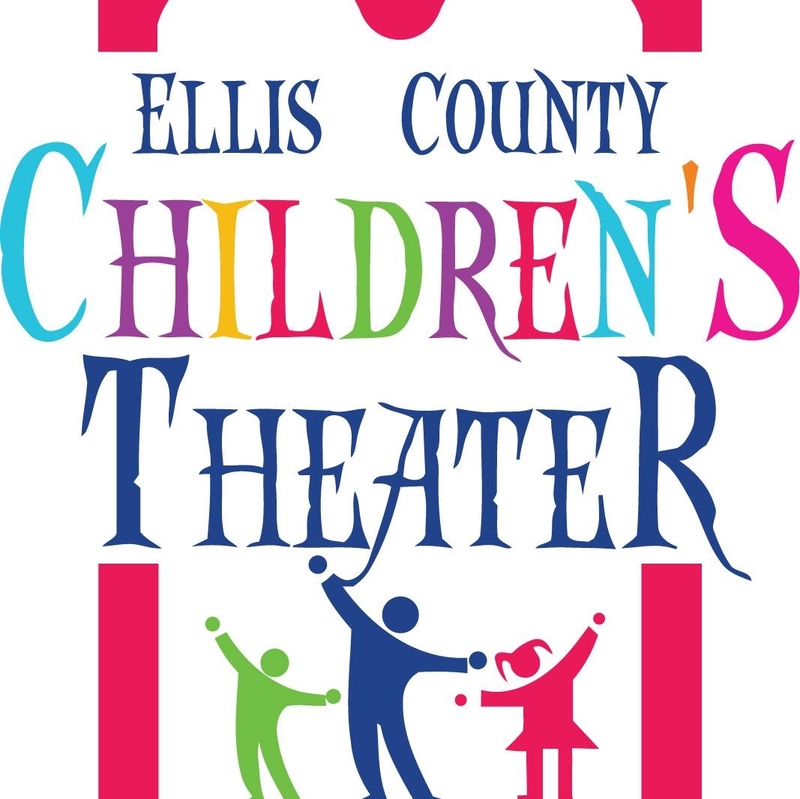 The play will also be directed by Brandon Williams for the Ellis County Children's Theatre at 3pm and 7pm December 1st, 2018. 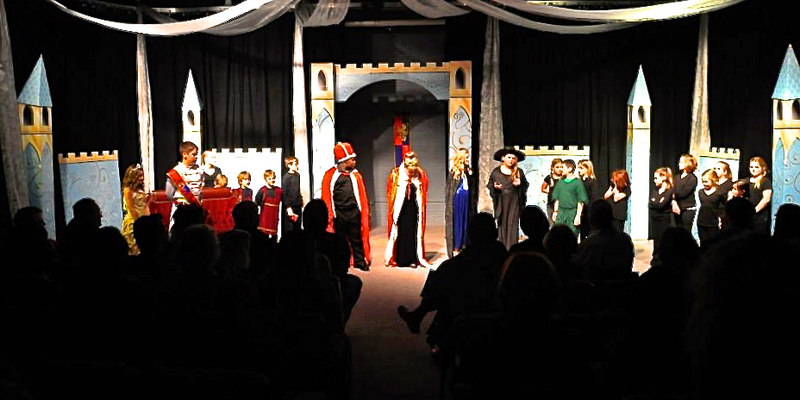 The 2013 production at the Magnolia Arts Council in Arkansas. For information on producing this play, contact YouthPLAYS. Get the play from YouthPLAYS.